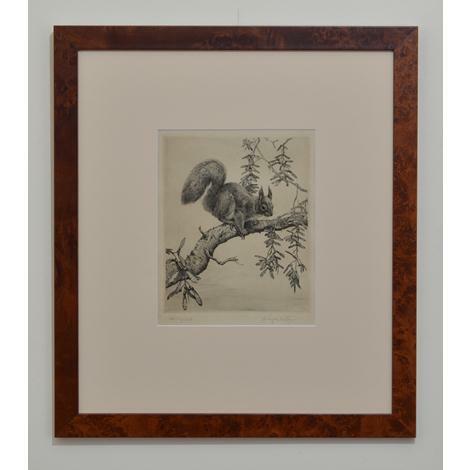 Austen's delightful image of a red squirrel is executed with great delicacy. The squirrel is poised - stock still, alert - amongst long racemes of the winged fruit of an Acer; the problem is, which one? The tree is probably the box elder, Acer negundo, native to North America, but cultivated in Britain from c.1688. It is certainly an ornamental tree - likely to have graced a garden. We know Austen was a keen naturalist, as well as artist. Was she making a wry comment, here, about the fact that, since 1876, when grey squirrels were introduced to the British mainland, they started to oust the native reds? The grey squirrel, of course, also comes from North America. Newly mounted and framed. Signature clear.